At Paragon Dental, we are thankful for so much: you, our amazing team members, pumpkin pie, the golden leaves of fall and the many advancements in dental technology. And while we assume our patients are thankful for the first four too, we know they’re thankful for the last. We don’t need to tell you about how far along modern technology has come in the past couple of decades, but we can’t help but to brag about the advancements in dental technology, especially since these advancements have made it far easier to care for our patients in a comfortable, safe and pain-free manner. At Paragon Dental, building trust with each of our patients is fundamental in achieving the desired results, and these new technologies help to establish that trust by helping us be the caring, compassionate and skilled dental team we know we can be. 7000 BC – The Era of the Bow Drill: The bow drill was used to cure all tooth problems…as well as to create the friction needed to start fires. It was a handy little tool. Funnily enough, the bow drill was introduced at about the same time as dental assistants. You see, in order to operate the bow drill, the dentist needed an assistant to hold down the patient’s flailing arms and legs as the dentist went to work on their teeth. 1790 – The Era of the Dental Foot Engine: Nothing good can ever come from a tool that contains the words “dental,” “foot” and “engine” in its title. 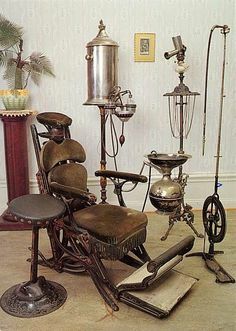 The Dental Foot Engine was a drill attached to one end of a rotary cable, which was attached to the wheel with gearing and a belt. The dentist – or maybe his assistant? – would push the pedal up and down. The key objective? To get the drill to spin. Not only would this make for a rather tedious drilling process, but we can imagine the technique wasn’t free of hiccups either. The Era of the Dental Key: The dental key was first introduced in 1730, and, much to our surprise and dismay, remained the most popular tool for pulling teeth until the 20th century. The dental key was modeled after a door key, and was used by first inserting the instrument horizontally into the mouth. Once in, its “claw” would be tightened over a tooth and then rotated to loosen the tooth. This often resulted in the tooth breaking, causing jaw fractures and soft tissue damage. Thankfully, today we have our high-speed, hand (not foot!) -powered dental drill to assist us with cleanings, fillings and a variety of restorations. Our dental assistants are there to comfort and educate you, and not to pin down your various body parts. Extractions require specialists, who are educated in specialized technologies. And at Paragon Dental, the only kind of key we use is the kind that unlocks doors, of both the figurative and literal variety. If you’re thankful for a more pleasant dental experience, please like and share this post with others! We would also love to hear what more you’re thankful for during this 2014 holiday season. Visit http://www.paragondentalinc.com/our-services/ to see what services we’re able to provide because of modern technology, and how you’ll benefit from them as much as we do!